It’s 1987 and 26-year-old Malcolm Castle is going up in the world. He’s made it through eight long years as a rookie fire-fighter, he’s become an accepted member of Red Watch in Shrewsbury – and he’s just got his pilot’s licence so he can fly far above the town in his brand new microlight. From the skies the glorious medieval streets of Shrewsbury and the endless rolling hills of Shropshire look infinitely peaceful. But Malcolm knows they will always spring plenty of surprises. Life in the country fire service is as crazy, dramatic and heart-warming as ever. And it is changing fast. Out on the watch Malcolm has qualified to crew the two-man Emergency Tender that is first on the scene after the worst road traffic accidents. 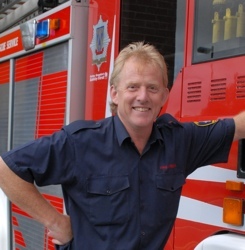 He’s got a whole lot of new cutting, lifting and other kit to train on and operate – and he will do so amidst some of the most emotional incidents of his career. Back at base he’s in the thick of it as colleagues face a series of challenges to the old order. First come plans to halt drinking on duty and close down the fire station bar. Then there are calls to heed embryonic health and safety warnings and stop playing psychotic volleyball and amateur ice hockey games in the station grounds. Finally there is the wild rumour that women may soon be allowed to join the fire brigade as well! 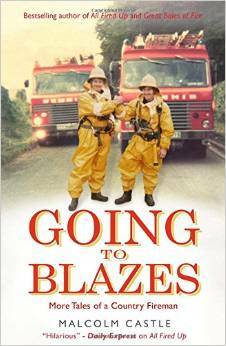 In Going to Blazes? the endlessly varied nature Malcolm’s work triggers plenty of laughs and sees him get up close and personal with a wide variety of four legged and even feathered friends that have got themselves in all sorts of trouble. But it also brings in some of the most emotional and tragic rescues of his career – including the death of a baby in a car accident and of a young mother and child in a house fire. It also sees great joy in his personal life – as he meets and goes on to marry his wife Karen with a full Fire Service Guard of Honour. And through it all the book continues his unique celebration of the glorious English countryside.